I had this breakthrough around ‘time’ this past week. It was too late to put in my Newsletter this month. It was about how although we can’t change our past – it happened – we can change how we responded to it which will assist us to shift our perceptions of the past and our fears. Tom Campbell and I discussed this in our latest interview. Check it out. We start the month with Venus in retrograde (since October 5th, 2018). On October 31st, she retrograded back into the sign of Libra slightly shifting the energy from releasing values that no longer serve us to focusing on relationships. Do we need to release the relationship, or do we need to focus on repairing it? How are the people in your life serving you? Don’t act on those questions right now, just continue to ponder them. Wait until she stations direct on November 16th to move forward with your decision. Also, on November 16th, Mercury will station retrograde in Sagittarius. This stimulates our minds higher beliefs. Our mind is being asked to look at our Souls (higher) perspective. One needs to look at the greater purpose of what our soul desires. Trying to think your way through your purpose is difficult now, so just accept what comes to your mind and allow the process to unfold. “’Doing’ is a means to an end but ‘Being’ is a choice.” This quote came to me as I was preparing for a meditation this month. I thought it was important because it embodies what I have been teaching for years now. Things happen and we react to what is happening by ‘doing’ something to change it if we don’t like what is happening. Even when our heart is in the right place we are still manipulating what is happening in our lives or the lives of others. We may try to fix, change, heal – but we are ‘doing’ something to manipulate what is happening. Doing is just a way to change our outside world. We may do things from fear or from a place of love – however it is still ‘doing’ something on the outside in hopes to change how we feel about what is happening on the inside. 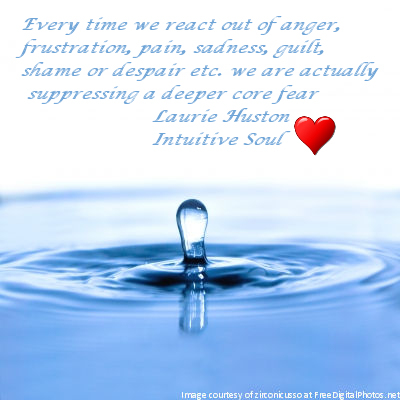 The outside world is dictating to us how to respond to a given situation. And this is backwards! 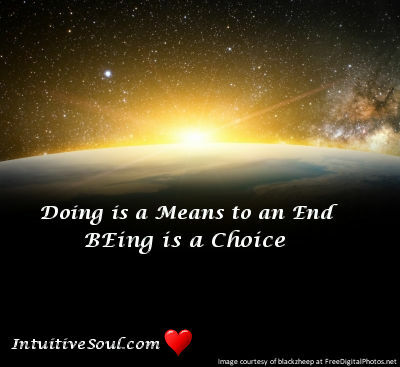 ’Doing’ is a means to an end but ‘Being’ is a choice. What happens to us isn’t a choice – how we respond to it is. How we choose to ‘show up’ to the world is a choice. How we choose to BE in any given moment is a choice. The outside dictates our reactions only when we are unconscious and stuck in linear time – thinking about the past or future and not in the NOW moment. We can choose to respond to any situation out of Love and Compassion. We can choose to BE happy or be angry when someone does something we don’t like. We can begin our day setting an intention of how we want to feel or BE during the day and make a conscious effort to remain in that energy all day regardless of what happens around us – because we have a choice! We are the only one who can choose how to ‘show up’ in our lives. Let me explain the bit about being unconscious and stuck in linear time. When something happens – good or bad – we/our brain (ego) automatically reacts to situations from our past experiences and our reactions are mostly unconscious. This is our brain’s way of compartmentalizing various responses and how we create patterns. Our brain believes we have already ‘defined’ our experiences and our emotions and sees each event as similar to another event so our brain automatically responds the same way as it did in the past. This is typically where we get stuck – because we have responded to betrayal or an accident or pretty much anything that has ever happened to us in the same way as we have before. It is why we see the world the way we do. It is part of our ‘story’ and that story continues unconsciously until we begin to see the world for the first time again … as we stand in the present moment BEing fully conscious. Then and only then can we choose how we want to respond in any given situation. And also be aware that there is a choice in how to respond. What happens to us isn’t a choice – how we respond to it is. 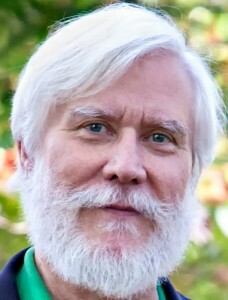 Laurie Huston from News the Heart is talking with physicist Tom Campbell on Time, Zombies and Choices. We begin this discussion talking about the perception of Time and how the Spiritual Community may not be helping us understand time. It isn’t an illusion, the past happened and our fears were programmed by the age of 7. We can go back to the core fears established and shift our perceptions of them to perceive them differently but not change what happened. As we know how we see the world is based on our perceptions of the World that is established by the perception we chose from our experiences. Prior to age 7 we didn’t have emotional maturity to understand what was happening and how our fears manipulated these experiences. We talked about the “zombies” we all know and often become when we are on auto-pilot and how to become more aware and conscious so that we can make better choices. Which lead us to discussing choices. We have the choice how we want to respond in each moment and the choices are either Love or Fear. Every choice is a reaction within our lives. The more conscious you are of your fears, the more you have the option to make better choices and BEcome Love. Taking responsibility for how we choose is knowing our intentions and motivations so we can make conscious choices. 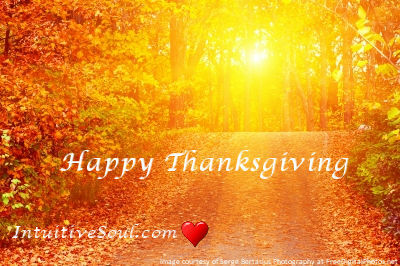 Remember we are here to Grow towards Love not stay stuck in our fears! Join us for this fascinating discussion! We’re Getting to the Heart of what Matters! I can’t believe 2017 is now closed and we step forward into another year. 2017 was a 10 year or a new beginning year that brought with it many changes and challenges. Were you able to create some exciting new beginnings? 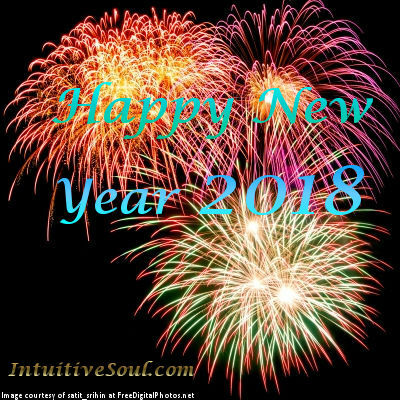 2018 is an 11 year in numerology which is a master number making it a year of Mastery. It also is brought down to a 2 year (11) 1+1=2 which makes it about Love. 2018 as a 2 year has Love, connection, partnership, relationship, patience, sensitivity in a gradual progress whereas an 11, the double 1’s, create a vibration that embodies Divine Inspiration and making things happen with an intensity. It is a year to gain mastery over your life and understand the subtle framework of the Universe! Inspiration: How will you Master 2018? I have seen different posts on what this year will be about. 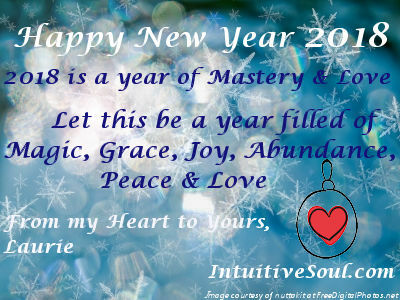 Intuitively I feel that this year is about Mastery and Love. I feel it is always important to set your intentions each New Year and forget your resolutions. Intentions are a choice we make that signals the Universe to help us create from a state of BEing, Grace, and clarity. Resolutions are something that we set and often, when we don’t achieve them, create a sense of failure. It is by definition a tradition in which a person resolves to change an undesired trait or behavior to accomplish a personal goal or otherwise improve their life (Wikipedia). When we set Resolutions we come from a place of doing. ‘Doing’ results in falling back into old patterns – especially if we haven’t changed any of our beliefs, fears or expectations – because we are trying to control, manipulate, change, fix or heal ourselves from this ‘doing’ state. This state doesn’t recognize our Being and Divine Self. Intentions, to me, are about connecting into how we ‘intend’ to feel and come from a state of BEing not doing. In my show with Tom Campbell, he suggests it isn’t what you DO rather how you do it. It’s who we are while we do it or how we are BEing. Have a Happy Magical New Year! Laurie Huston from News the Heart is talking with physicist Tom Campbell on Intentions and BEing vs doing. This is a deep conversation about the choices we make and whether we choose our intentions from a doing place or how we want to BE. We often come from a mental ‘doing’ space when we write our Resolutions for the year. And unless we come from our BEing level, we aren’t likely going to make any lasting changes. We discuss sugar, weight-loss, health, fitness and addictions and how we can approach them differently and what we need to make lasting changes. We have to own our problems, take responsibility for our fears and choices. When we have something we want to change, like our weight because it impacts our health, we have to have the correct motivation and approach it understanding what the underlying cause is. This is where we need to dig deeper than just our mental will to change. If we are just thinking it is best that we change, or it is healthier for us, we are really just coming from a mental state and not looking at how we want to BE differently. We have to figure out what the cause of the weight gain was in the beginning. Like smoking, we can use our will to loose weight and stop smoking, however, if the underlying cause is still present, and it is how we are BEing in the world, that fear will continue to create our addictions to food, sugar, alcohol, or smoking once our will looses it’s initial energy because the fear is still there! This is why mental ‘fixing’ doesn’t work. Once we establish the underlying fear, we have courage to BE okay with it and allow the shifts to occur and having acceptance. Coming from a place of Love will always create what it is we desire most. Join us for this important discussion! We’re Getting to the Heart of what Matters!